Insurance is not required to own a Jungle Float. 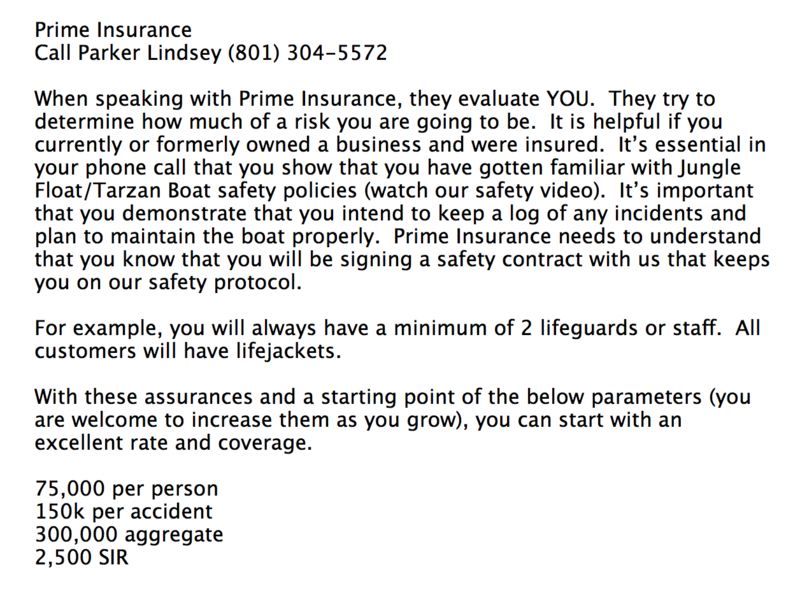 If you consider going without coverage, open an LLC (limited liability corporation) to protect yourself and your assets while running a safe operation, requiring everyone to sign the waivers and having lifeguards present making sure people follow the rules. Coverage can be very different: coverage as a boat, coverage as an attraction, trampoline gym. Liability in different forms and number of people you expect. Insurance will differ from U.S. state to state and country to country. If they offer bungee jumping coverage or trampoline park or jet ski or rock climbing gym coverage, they will offer Jungle Float coverage. ​Remember, to review our specific safety procedures and video and make it known that we recommend lifeguard supervision and the use of a waiver to protect all owners. As you inquire with banks and institutions for financing, let them know that we issue a proper boat title with a HIN or VIN that allows the bank to be a lien holder. Many banks and institutions offer personal loans, business loans, home equity loans and equipment or boat loans. Our first recommendation is LeaseProcess. LeaseProcess offers excellent customer service (call Dillon) and they are happy to answer questions about your options. Call 800-942-9830 ext 230. Leasing offers many advantages: You can receive 100% of your financing and your payments may be tax deductible. Laurie and her husband Dave have been in the financing business over 31 years. Call them and discuss your needs and they will match you with the proper lender. Travis Bolio offers 100% financing and also offers financing needs beyond -- such as shipping and setup. Investors: It is easy to excite others in your area of Jungle Float and many immediately see the earning potential. Show the video to other businesses-minded people, entrepreneurs or ambitious thinkers in your area and you may be surprised to see how quickly someone will back you in a great idea such as Jungle Float.